Welcome to Bed and Breakfast “La Peregrina”, we extend to you a very warm welcome to the Enchanted Galapagos Islands. For over 23 years we have provided personal quality service to all our guests. We have ample garden areas with many native trees and plants that surround our B&B, here you can find many species of native birds, like finches, fly catchers, mocking birds, dark billed cuckoos, and yellow warblers. You may also find hammocks where you can enjoy a good book or a peaceful siesta. We have an atmosphere like no other in Puerto Ayora; an atmosphere where you can relax and replenish your energies to continue your Galapagos adventure. 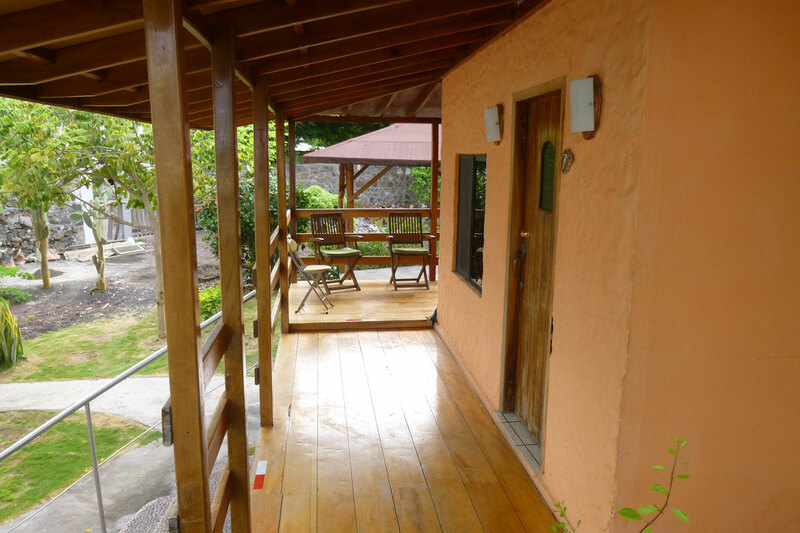 “La Peregrina Bed and Breakfast ” is located in Santa Cruz island in the town of Puerto Ayora, Galapagos. We are in the Heart of town, on Charles Darwin Ave. (main street), across from the Pelican Bay waterfront, and diagonally across from the Pacific Bank. Only 5 min. away from us is the principal wharf of Puerto Ayora and in the opposite direction, 10 min. away is the Charles Darwin Research Station and the Tortoise breading Center. Breakfast: Included in the Price. It is served from 7 am to 9 am. The breakfast is different each day, but a typical breakfast is: whole wheat bread, jam and butter (not margarine), coffe (percolated not instant) or tea, scrambled or fried eggs, a portion of fruits (varied assortment depending on the season and a fruit juice). Laundry service: Our one day laundry service includes washing and drying and the price is USD$ 2,00 per kg. Safety Deposit Box: We provide safety deposit box service in the reception desk. Although our B&B is very safe, we do not take responsibility for any valuables left in the rooms or adjacent areas.